Organization: U.S. Congress, House Agriculture Committee, House Judiciary Committee, and Select Investigative Panel. Biography: Congresswoman Suzan DelBene represents Washington’s 1st Congressional District, which spans from northeast King County to the Canadian border, and includes parts of King, Snohomish, Skagit, and Whatcom counties. 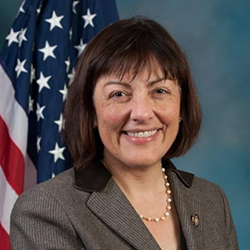 First sworn into the House of Representatives on November 13, 2012, DelBene brings a unique voice to the nation’s capital, with more than two decades of experience as a successful technology entrepreneur and business leader in the private sector. Her depth of experience and focus on achieving concrete results allows DelBene to break through Congressional gridlock and get things done, earning her praise from the Everett Herald, who called her “the most prolific, effective member of her freshman class.” DelBene takes on a wide range of challenges both in Congress and in the 1st District. When the I-5 Bridge collapsed in May 2013, Congresswoman DelBene fought to secure emergency funding to immediately rebuild the bridge and help ensure that the Skagit Valley stayed open for business.And in the aftermath of the mudslide in Oso, DelBene worked to ensure the federal government did everything possible to help victims, their families, and all those affected by one of Washington’s worst natural disasters. Congresswoman DelBene is a strong voice on the House Agriculture Committee for Washington’s farmers and growers. She was the only Member of Congress from Washington state on the bipartisan Farm Bill conference committee, which successfully negotiated a 5-year Farm Bill that was good for farmers and ranchers, preserved nutrition benefits for working families and children, and included $200 million for DelBene’s legislation to expand job-training opportunities for SNAP recipients. Washington recieved $22 million for its job-training pilot. At the start of the 114th Congress, she was named Ranking Member of the Subcommittee on Biotechnology, Horticulture, and Research. Through her role on the House Judiciary Committee, DelBene is at the forefront of issues relating to technology and privacy, and has become a leading voice in the House calling for greater transparency and oversight of the NSA to restore American’s privacy rights, which passed. She is also focused on advancing common-sense immigration reform and is a lead sponsor on H.R. 15, the Border Security, Economic Opportunity and Immigration Modernization Act, a comprehensive immigration reform bill with more than 200 cosponsors. DelBene was appointed to serve on President Obama’s Export Council, the President’s advisory committee on international trade. She also serves as co-chair of the New Democrat Coalition’s 21st Century Job Skills Working Group, and co-chair of the Women’s High Tech Caucus, Internet of Things Caucus, Trademark Caucus, and Aluminum Caucus. Suzan spent part of her early childhood in Newport Hills and Mercer Island before her father, an airline pilot, lost his job. After fourth grade, her family moved all over the country in search of work. With hard work and financial aid, such as student loans and work study programs, she earned a bachelor’s degree in biology from Reed College. Following Reed, Suzan worked in the biotechnology industry before earning an MBA from the University of Washington and embarking on a successful career as a technology leader and innovator. In more than two decades as an executive and entrepreneur, she helped to start drugstore.com as its vice president of marketing and store development, and served as CEO and president of Nimble Technology, a business software company based on technology developed at the University of Washington. Suzan also spent 12 years at Microsoft, most recently as corporate vice president of the company’s mobile communications business. In 2010, Suzan was appointed by Governor Gregoire to be the Director of the Washington State Department of Revenue. During her tenure, Suzan proposed reforms to cut red tape for small businesses. She also enacted an innovative tax amnesty program that generated $345 million to help close the state’s budget gap, while easing the burden on small businesses. DelBene’s mix of real world experience in the private and public sector gives her a deep understanding of how to build successful businesses and create jobs, implement real fiscal accountability, and adopt policies that provide individuals with access to opportunity. She knows what it will take to ensure that our nation and this region lead in creating high-wage 21st century jobs—great educational opportunities for our children and ongoing training for adults; a financial system that is fair, strong, and transparent; incentives that foster research, innovation, and entrepreneurship; and a health care system that works for everyone. She will continue fighting for these priorities in the other Washington. DelBene was named a Champion of Main Street Businesses by the Washington Retail Foundation, and received the 2014 Distinguished Community Health Advocate Award from the National Association of Community Health Centers (NACHC) for her work to expand access to care for our nation’s most vulnerable communities. She was also awarded the President’s Award from the NAACP for her work on behalf of veterans and their families. Suzan and her husband, Kurt DelBene, have two children, Becca and Zach and a dog named Reily.